Porcelain veneers are often the ideal choice for anyone who wants a brighter or more uniform smile. As one of several cosmetic dentistry treatments offered by Parma dentist Dr. Rebecca Gecovich, they can help you achieve the look you’ve always wanted. 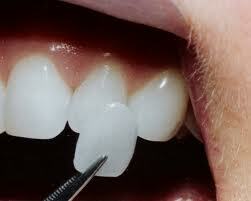 Porcelain veneers are thin layers of tooth-colored porcelain which attach to the fronts of teeth. Unlike crowns, they do not cover the whole tooth—just the part of the tooth that people can see when you smile. They’re a long-lasting solution that will enhance your smile for many years to come. They’re cosmetic in nature, which means that they can correct almost anything that has to do with the shape or color of your teeth. Tooth Gaps: Many people have what’s known as a diastema, or a gap between two teeth. Although it doesn’t pose any issues with oral health, some people prefer the closed look and have their diastema closed. Uneven Spaces: Sometimes it’s not one big gap between teeth, but rather several oddly shaped gaps that can make teeth look uneven. By putting new “faces” on the teeth, the gaps can be closed or made more uniform. Chipped Teeth: When teeth have minor chips or irregularities, they can look unsightly. Porcelain veneers can be made to match the ideal shape and color to hide issues like this. Crooked Teeth: Although severely crooked teeth may require the use of braces and other orthodontic appliances to correct, sometimes porcelain veneers can be used to make crooked teeth appear straight. It’s a good alternative for someone who wants faster results than orthodontics can provide. Discolored Teeth: Tooth whitening treatments are traditionally the go-to for anyone who wants to brighten their smile. However, certain stains and medical conditions can make whitening less effective. In these cases, porcelain veneers can often be used to achieve a dramatically whiter smile or more even coloring pattern. Porcelain veneers are generally placed in two visits. During the first appointment, the teeth are prepared and impressions are taken. A cosmetic dental lab creates them, and they’re placed on the second visit. Dr. Gecovich will have you try them on to make sure you’re happy with the results, and then will use a dental cement to secure. From there, you’ll simply follow up with your regular cleaning and exam visits. There are many ways you can improve the look of your smile, and this is only one option. If you’re interested in any form of cosmetic dentistry, Dr. Gecovich will meet with you to discuss your goals and what options are best suited to help you reach them. You may book a consultation through our online form or call the office directly.